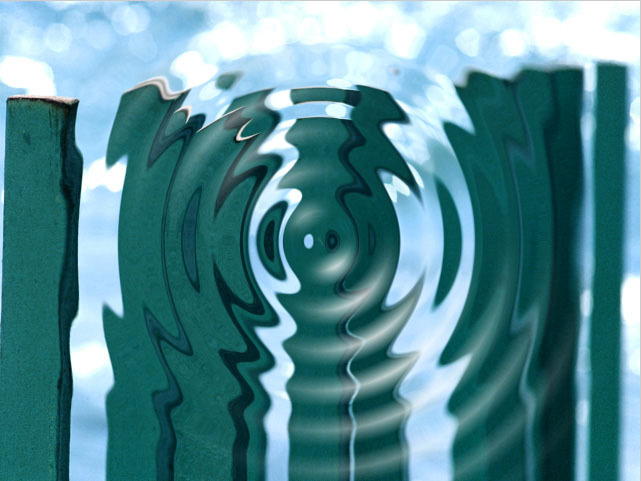 The Ripple ﬁlter simulates ripples spreading out from a point of origin in a pool of water, similar to what you see after tossing a pebble into a pond. 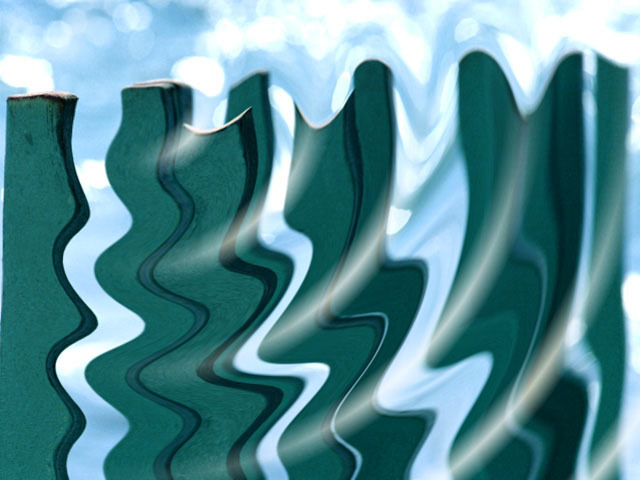 This ﬁlter automatically creates animated ripples and allows you to choose from a range of wave shapes. If the Correct Non-Square Pixels checkbox is selected and the ﬁlter is applied to media with non-square pixels, the ﬁlter converts the pixels to square pixels (maintaining the height), applies the ripple, and then converts the pixels back to their original format. This helps to prevent distortion. Selecting the Process Alpha Channel Only checkbox allows you to distort the alpha channel without changing the underlying colors. Radius determines the radius of the full-strength ripple. Points within the range set by the Radius value will be fully displaced by the ripple. The ripple waves decay as they move beyond the range of the radius, and points more than two times the radius from the center are not affected by the ripple (when Falloff is at 0). For example, if you set Radius to 50, all pixels within 50 units of the Center Point are fully distorted by the ripple. Points between 50 and 100 units are affected less as the value approaches 100. Pixels beyond this range remain unaffected. Center Point sets the coordinates of the center point of the ripple on the X and Y axis. Note that the center point must be placed within the source image. 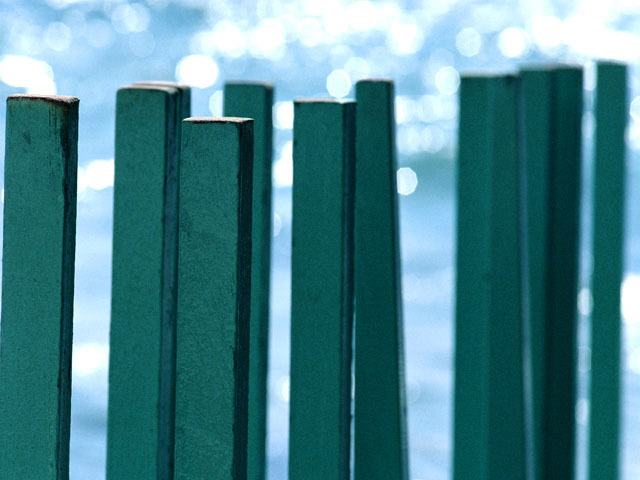 Height determines the amount of displacement in the direction of wave motion. Perpendicular Height determines the amount of displacement perpendicular to the direction of wave motion. 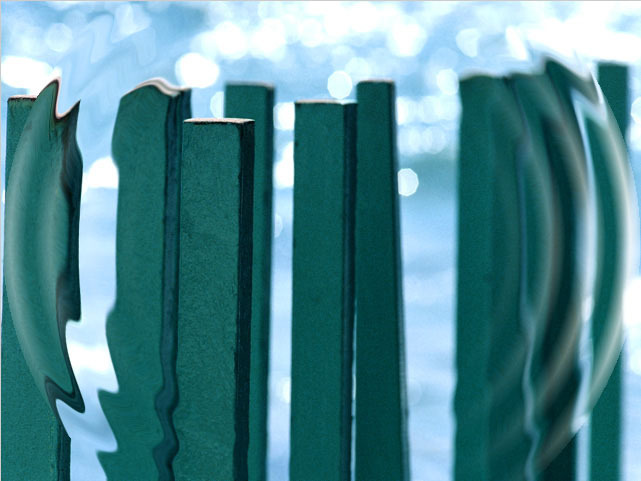 Wave Width determines the distance between the peaks of the ripple waves. 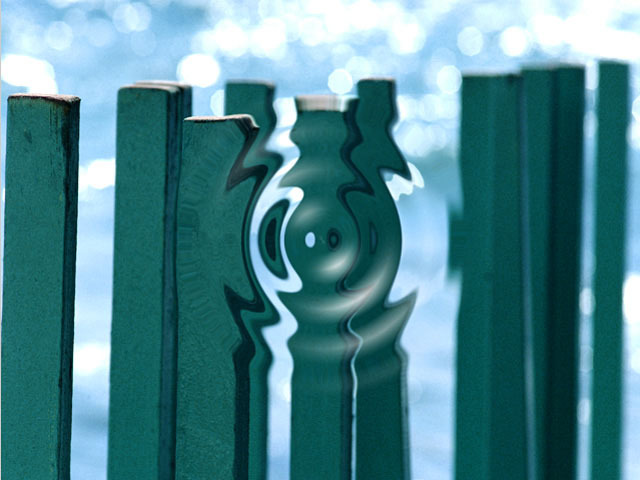 The Wave Width does not affect the maximum displacement of each point in the image, but does affect how fast the displacement changes from point to point in the image. Wave Width also affects the number of waves in the effect, because as the waves become wider, fewer ﬁt on screen. 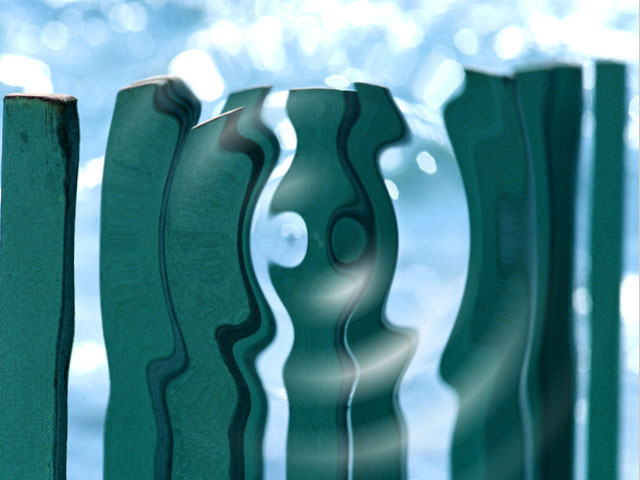 Speed and Phase control the motion of the ripple waves as they move from the center of the ripple. Speed controls the rate at which the waves move, and Phase controls the position of the waves. The default Speed setting is 10 moves the ripple out by one wave width per second. 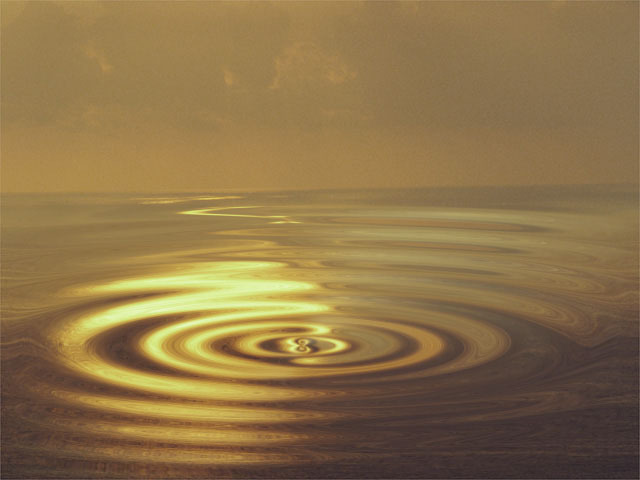 A negative Speed value moves the ripples in toward the center. When Speed is set to 0, the ripple is stationary (unless Phase is animated). Note: The Speed and Phase controls provide several ways to control the movement of your ripple over time. Leave Phase at its default setting and adjust Speed. Try this technique if you care about the overall motion of the effect but not about the exact number of waves created. If you want to precisely control the point in the waveform at which the Ripple begins (for example, whether it begins at a peak or a trough), move the position indicator to the ﬁrst frame of the effect and adjust the Phase control until the wave is at the desired point. If you want to control the number of waves that move out over the duration of the clip, set Speed to 0 and animate Phase to create movement. For example, suppose you want exactly ﬁve waves to form and disperse during the clip. At the ﬁrst keyframe of the clip, set Phase to 0. Set the keyframe at the last frame in the clip to 1800° (5 x 360°). Exactly ﬁve full waves form over the duration of the clip. If you want a static (not animated) distortion, set Speed to 0 and do not animate Phase. Inside Radius sets the radius of a circle at the center of the ripple within which no distortion takes place. You can animate this parameter to produce a ripple that does not continuously ﬂow outward from the center, but instead produces a few concentric ripples that move outward and disappear. Falloff controls the rate at which the wave height drops off beyond the edges of the radius. Increasing Falloff causes the wave height to decrease more slowly (thereby creating a wider falloff area), and decreasing this value makes the wave height decrease more abruptly. 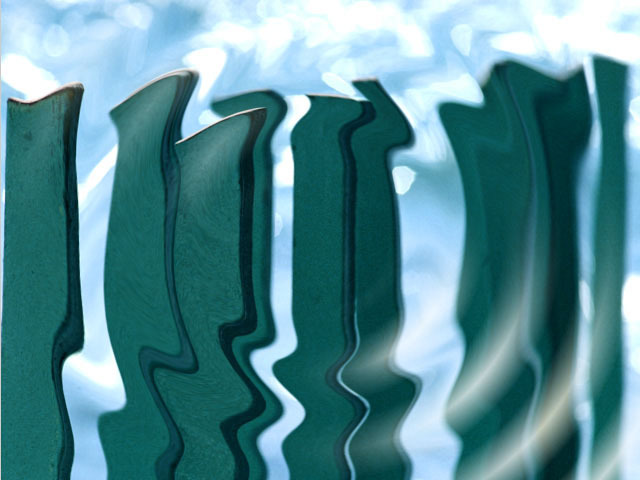 The Chaos parameters provide more options for controlling the appearance of the ripple, which can be useful for creating more realistic effects. The Twirl menu affects the behavior of the angular portion of the wave. The Twirl settings have no affect if Perpendicular Height is set to 0. When Twirl is set to Off, Perpendicular Height creates the same amount of displacement in the center of the ripple as it does at the edges. When Twirl is set to On, the displacement caused by the Perpendicular Height increases farther from the center. Super Twirl and Hyper Twirl further exaggerate the angular motion as the wave moves away from the center of the ripple. The WaveForm menu setting determines the shape of the wave. The choices fall into two categories: Shape waveforms and Spectrum waveforms. The Shape waveforms include Sine, Triangle, Square, Sawtooth, Circle, Semi-Circle, Uncircle, and Half-Sine. These names refer to the shape repeated on a graph that plots the displacement of each point in the wave on the Y axis and the distance of each point from the center on the X axis. 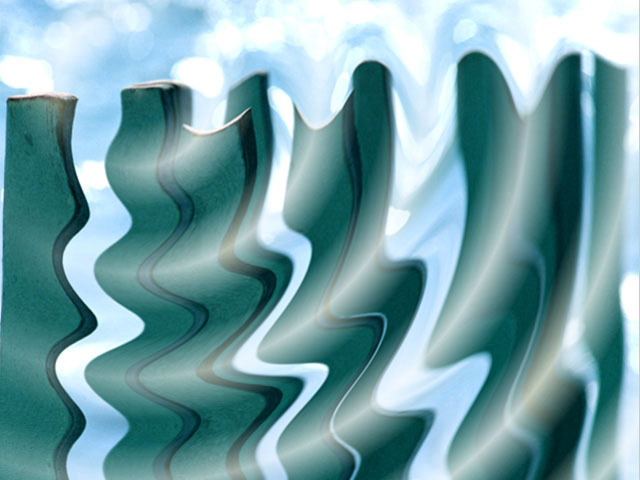 The Shape waveforms are mathematically derived and are not intended to look natural. For a more natural-looking alternative, experiment with the Spectrum waveforms. These are all variations on the sine wave that produce more realistic waves. Note: For illustrative examples of some of the various waveforms, see the Wave Filter – Click Here. The Chaos Wave’s waveform is determined by the Chaos Wave value, which relates to the fourteen Spectrum waveforms listed in the WaveForm menu. A Chaos Wave value of 10 uses the Spectrum 1 waveform, 20 uses the Spectrum 2 waveform, and so on. Values between two multiples of 10 create a mix of the two adjacent Spectrum waves. Chaos Blend controls the mix of the speciﬁed Waveform (determined by the WaveForm menu) with the Chaos Wave setting. If Chaos Blend is set to 0, the resulting wave conforms to the WaveForm setting. At a Chaos Blend value of 100, the ﬁlter uses only the Chaos Wave setting. Intermediate values blend between the two. You can change the Chaos Blend value to adjust the amount of chaos added to the basic waveform. 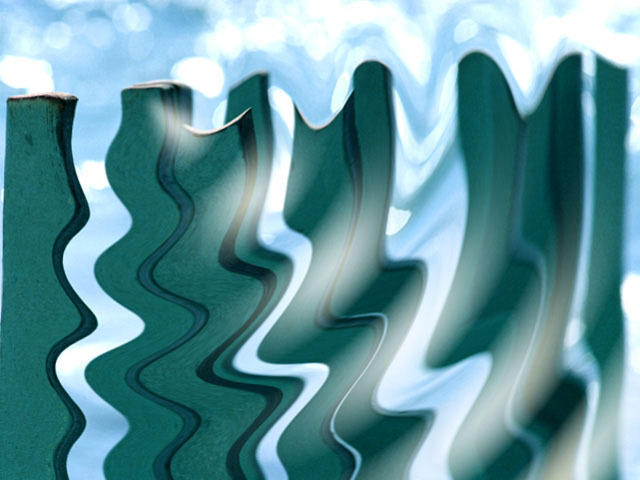 Wave Distortion distorts the shape of the wave, changing the displacement of pixels that are not at zero points (for positive values) or peaks (for negative values) in the wave. A zero point is a point in a wave which is not displaced; if you image a waveform drawn on a graph, the zero points are the points at which the wave crosses the horizontal axis. 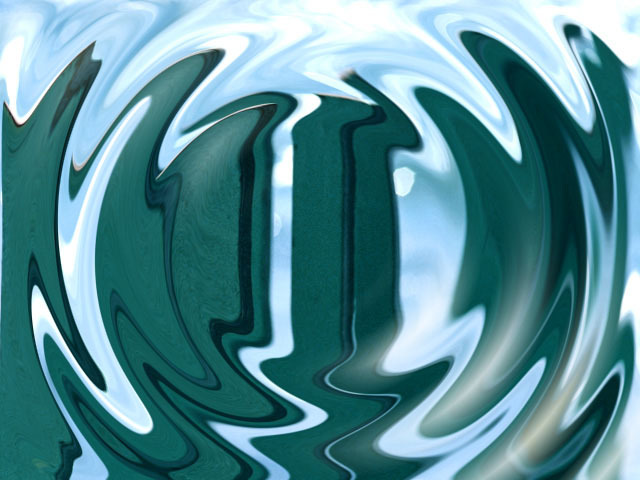 The Intensity menu adjusts the affect of the Height and Perpendicular Height settings on the ripple. Normal has no affect on the Height and Perpendicular Height settings and is suitable in most circumstances. Low scales down the Height and Perpendicular Height values by a factor of 10, which can be useful if you are working with small ripples and want ﬁne control over the parameters. Super multiplies the Height and Perpendicular Height values by a factor of 10 and can produce very exaggerated and unnatural-looking ripple effects. You can stretch or squeeze the area affected by the ripple in any direction by using Stretch and Stretch Angle. Positive Stretch values stretch the ripple, while negative values squeeze it. The Stretch Angle is the angle between the stretch direction and the horizontal axis. Note: Stretch is useful for adjusting the perspective of the ripple. 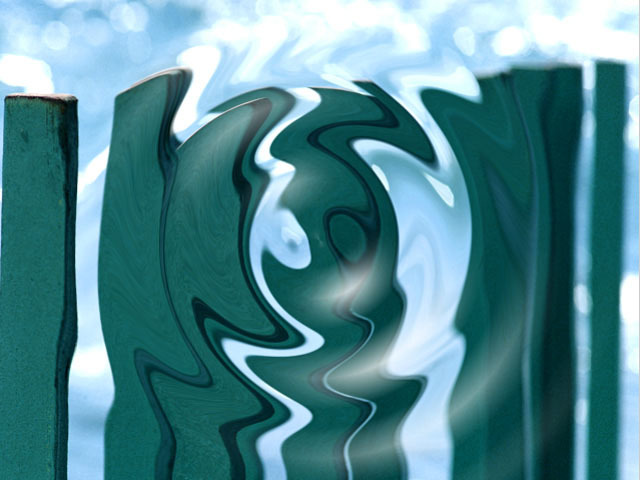 For example, you can create the appearance of a ripple in water viewed from the shore rather than from above. To achieve this effect, adjust the Stretch slider to a high value (between 75 and 100), and leave Stretch Angle at the default of 0. This effect generally looks best if Wave Width is decreased, which adds to the illusion of perspective by making the waves look closer together. In the following examples, the PixelChooser is used to apply the ﬁlter to a rectangular area ending at the horizon. If you see holes or tearing in the ripple after you stretch it, scale down the Stretch and Height parameters or adjust the Pinning controls to compensate. Light Level controls the amount of light applied to the image. At a value of 0, no light is applied. As the value increases, the light becomes more intense. 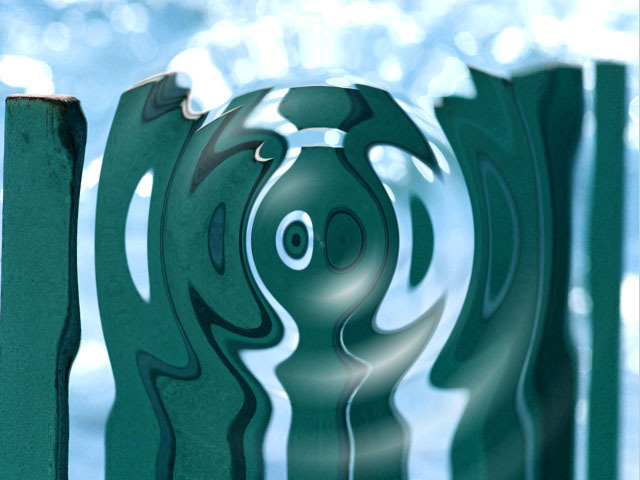 The Light parameters adjust the lighting of the ripple in the ﬁltered image. Light Color sets the color of the applied light. Light Width affects the size of the lit area on the wave crest. Increasing this parameter value causes a wider part of the crest to be lit; decreasing it diminishes the lit portion of the wave. Light Focus adjusts the shape of the light over each wave. Increasing Light Focus makes the light wider and more diffuse; decreasing Light Focus makes the light sharper and narrower. Light Angle sets the angle at which the light hits the surface of the waves. Light Elevation determines the distance between the light source and the image plane. 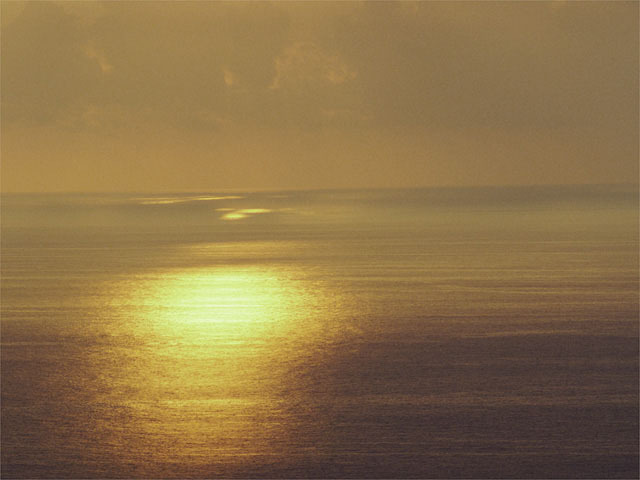 As Light Elevation increase, the light hits a larger portion of the ripple. Ambient Light adjusts the diffuse light on the image. The default of 100 does not add or subtract ambient light from the source image. Decreasing this setting makes the image darker before the other light is applied. Ambient Light illuminates or darkens the image evenly, and is unaffected by any other lighting parameters. Note: The PixelChooser does not affect Ambient Light. Ambient Light is applied to all pixels. This ensures that the PixelChooser does not create discrepancies in the overall lighting of the image before Wave is applied. At the default Ambient Light value, the PixelChooser behaves exactly as in other ﬁlters; at other values, the PixelChooser ﬁlters every parameter except Ambient Light. The Apply Mode menu controls how the ﬁltered image is composited with the source image. For descriptions of all the Apply Modes, Click Here. The BCC Distortion Pinning controls are used to fine tune edge treatment in situations where a distortion effect might cause regions from outside the image edges to be remapped inside the boundary. For more information on the BCC Distortion Pinning controls, Click Here.